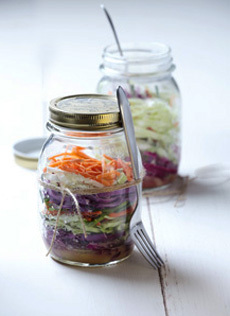  Layered cole slaw in a jar (photo courtesy Nestlé. 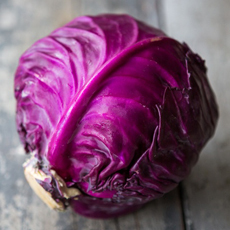 Purple/red cabbage is good-looking and full of antioxidants (photo courtesy Good Eggs). 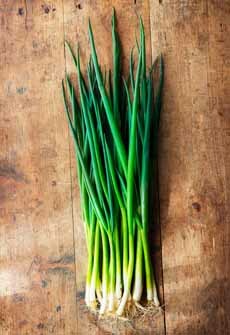 Scallions, also called green onions, have more onion flavor than their cousin, chives (photo courtesy Recipeland). We don’t know who came up with the idea of layered food in a jar. It happened sometime after some other unlauded person decided to serve drinks in Mason jars—a trend that grew so hot that manufacturers began to manufacture Mason jars with handles, and lids with openings for straws! Plating in an unexpected vessel—Martini glasses are also popular—turns food as ordinary as salad into exciting food. Want to get the family to eat more salad? Serve it in a jar! While layered salads are not news, we have been bringing 32-ounce jars of cole slaw when we visit friends or family. Everyone loves the low-calorie crunch, and we usually get a thanks for not bringing cookies or brownies. And while we’re at it, the history of Mason jars. This recipe, adapted from Nestlé is a welcome hostess/host gift at any time. It will be embraced by healthy eaters (one can’t have too many cruciferous vegetables), vegetarians/vegans, and the rest of us who simply love cole slaw. Here, purple and green cabbage meld with bright herbs, and the mayonnaise is replaced by a complex layering of flavor from Dijon mustard, apple juice, apple cider vinegar and honey (photo #1). You’ll need 8 pint-size or 4 quart-size Mason jars. Of course, you can make the recipe in a mixing bowl for home use, no jars required. You don’t have to be particular about brand: Mason jars vs. Ball jars, for example. You can use any jars you can lay your hands on. In fact, we have a friend who re-uses jars from the grocery store, and we give her points for recycling. She wraps colored elastic bands around the top of the jar with wine glass charms for glamour. Both of those are reusable, too. 1. WHISK together the vinegar, apple juice, salt, pepper, mustard and honey. Gradually add the oil in a slow, steady stream, whisking constantly until blended. Divide the vinaigrette between the Mason jars. 2. MIX the celery seed, fresh dill and basil, divided into the cabbage. 3. LAYER about 1/3 cup purple cabbage, 1/3 cup green cabbage, 2 tablespoons carrot and 1 tablespoon sliced green onions in each Mason jar. Add another layer (the same quantities excluding the scallions) of purple cabbage, green cabbage and carrots. For quart jars, continue to layer. You should have about an inch gap between the cole slaw and the lid so that it is easy to shake later. 4. SEAL the jars and refrigerate. When ready to serve, simply shake to coat the slaw with the dressing.